CORVALLIS, Ore. (AP) _ Imagine a world where every prediction from the 19th century came true _ people fly to work on winged cars, monarchies are the dominant form of government _ and mix it with mummies, enchanted necklaces and a cantankerous ghost. Purviance said the comic came together after a chance encounter with the book “The Mummy!” by Jane C. Louden. Purviance said he became enamored with the ideas in the 1827 novel about an Egyptian mummy brought back to life in the year 2126. For those who don’t know, steampunk is the name of a sub-genre of science fiction and fantasy that blends high tech with style elements from the Victorian era of the 19th century. For instance, a computer might feature fancy bronze embellishments. 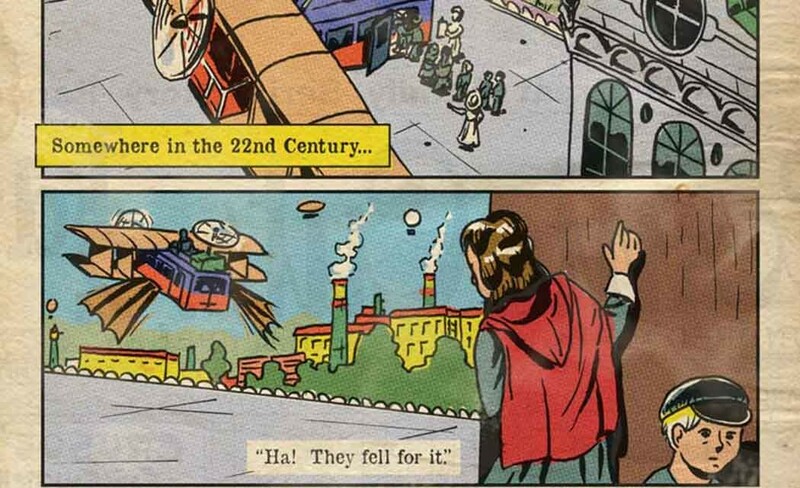 Purviance says he draws inspiration regularly from the out-of-this-world predictions made with the public domain postcards “France in the year 2000” by Villemard and Jean-Marc Côté. The postcards illustrate fanciful events, such as people playing croquet in the ocean or teachers feeding textbooks to their students through a machine. But it’s not just the technology that Purviance carried over. While the book is hand-drawn and inked, Purviance uses digital artistry to add dialogue balloons, create a particular color or lend a vintage look to the imagery. Purviance, who makes his living as a project manager at Corvallis’ Eduworks, insists there is no money in the book, but it’s an addictive hobby, and Purviance and his loyal readers can’t get enough. Hundreds of regular readers check out the latest pages of the book when they’re released, and often they provide feedback in comments below the pages themselves. The constant feedback allows for the webcomic to have an interactive element. Purviance said he plans to finish Volume II this year and will likely begin Volume III next year. “I had kind of mucked with things a bit after making the first one, and I think now I’m going to have to do a third one, or people are going to be mad at me,” Purviance said. To read “I, Mummy,” or to learn more about Purviance’s work, see i-mummy.com.